Abby came into the family as an adult at 5 years old, but settled in well. She was fetch mad when she got here and would play all day if you were willing. 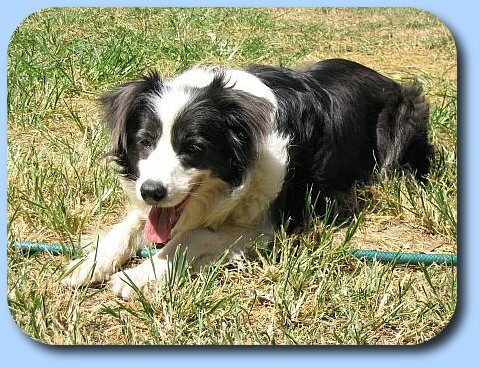 Abby is a dark blue colour, which mostly shows on her silvery ears, but the blue coat is lighter than the normal black and white dogs. Abby was tested and found to be clear of Neuronal Ceroid Lipofuscinosis (CL), as per Genetic Science Services report BRC1610. Abby has also been tested for Trapped Neutrophil Syndrome (TNS) by Allan Wilton and found to be clear of this mutation as per test report BC2569. 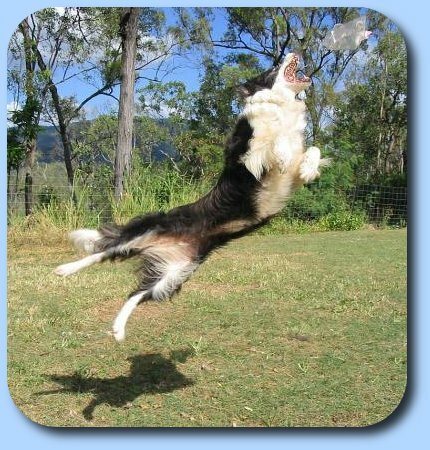 For more information, please see the Border Collie Health page.